On the second day (our first day was spent deliciously cultivating Ideas), I introduced what I called “Pages” based on Julia Cameron’s practice found in The Artist’s Way. I had read that Aimee Buckner (Notebook Know-How) also does this with her fourth graders, so I felt justified in bringing the challenge to younger people. For these 3rd – 5th graders, I asked them to put pencil to paper to fill one notebook page with stream of consciousness ramblings. I told them that “I do not know what to write. This is boring. My hand hurts...” was just as valid as “The pig jumped in the oatmeal. Mrs. Pig. Boing. Woah!” They were eager to try it. And while their hands did hurt by the end (good time for a lesson on proper pencil grip!) they were impressed that they had just written over 100 words in 15 minutes. Sloane, who loved to write but had a strong internal critic, was thrilled with the opportunity to get her silly, crazy thoughts down on paper with strict instruction not to judge. 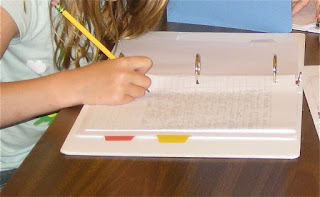 Jon, who only wrote single letters across his first page, independently asked if he could try it again later with words. We were getting somewhere. I love this practice. I do my best to stick to the regimen of my adult version, 3 notebook pages by hand daily. I look at it as the garbage pickup for my brain. All the silly worries and lists of things to do and strange feelings are downloaded onto the page, leaving me free to move on with other writing and the rest of my day. When you commit to this practice over weeks and months, interesting insights begin to appear. New ideas you didn’t know were hiding behind some subconscious brick wall, waiting to be invited out for tea, suddenly clamor for air. I fully believe in letting kids having freedom of topic choice. I did ask them to try some strategies from our mini-lessons, but after about 10 minutes they were free to either continue that work, or move on to their other ideas. Sophia, a third grader who had attended many camps in the past elsewhere, declared that this was her favorite simply because she was allowed to write what she wanted. After kids learn how to generate their own ideas, there's really no stopping them. Seriously—how else are we going to convince kids that writing is a pleasurable activity unless we let them do what inspires them?